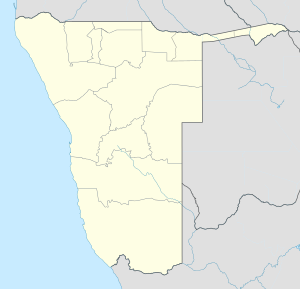 Outjo (Otjiherero: small hills) is a city of 6,000 inhabitants in the Kunene Region of Namibia. It is the district capital of Outjo Constituency. It is best known as a main gateway to Etosha National Park. The town was founded by Germans under the command of Colonel Theodor von Leutwein in 1897 as a small military base in order to explore the northern area of German South West Africa. The local historical museum (Franke Haus Museum) details the campaign of Major Viktor Franke in Ovamboland. The "Naulila monument" commemorates the small expedition on the Portuguese fort of Naulila in Angola by Major Viktor Franke in October 1914 following the massacre of a German delegation which had been sent to negotiate a treaty of non-aggression. The town lies near Gamkarab Cave, known for its stalactites and stalagmites and its pietersite. The caves are on private ground and not open to the public. Outjo is governed by a municipal council that has seven seats. The 2015 local authority election was won by SWAPO which gained four seats (1,307 votes). Two seats went to the United Democratic Front (UDF, 706 votes), and the remaining seat was won by the Democratic Turnhalle Alliance (DTA) with 381 votes. Situated on the C38 90 kilometres (56 mi) southwest of Anderson Gate, Outjo is the gateway to the Etosha National Park. Damaraland is also reached by travelling through Outjo on the C39 to Khorixas, and the C40 towards Kamanjab leads to the Kaokoveld. Outjo has an airstrip about 10 kilometres (6.2 mi) out of town that accommodates small fixed-winged planes. Outjo is the terminus of a branch railway of the Namibian railway system, but there is no railway service at the moment[update]. ^ "Table 4.2.2 Urban population by Census years (2001 and 2011)" (PDF). Namibia 2011 - Population and Housing Census Main Report. Namibia Statistics Agency. p. 39. Retrieved 24 August 2016. ^ "Local Authorities". Association of Local Authorities in Namibia (ALAN). Retrieved 1 October 2012. ^ "Outjo - town in Namibia". namibweb.com. Retrieved 27 September 2011. ^ "Know Your Local Authority". Election Watch (3). Institute for Public Policy Research. 2015. p. 4. ^ "Local elections results". Electoral Commission of Namibia. 28 November 2015. p. 5. Archived from the original on 10 December 2015. This page was last edited on 14 November 2018, at 05:38 (UTC).